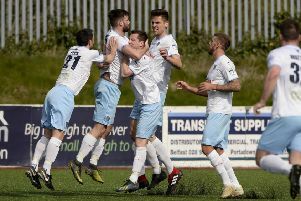 Ballymena United stretched their unbeaten run to seven games with a hard-fought 2-1 victory at Warrenpoint Town. Matthew Tipton and David Cushley had given Glenn Ferguson’s side a two goal lead but they had to withstand a spirited fightback from Warrenpoint after Stephen Hughes’ goal before they claimed their first ever victory at Milltown. Warrenpoint started brightly with Stephen Hughes’ pass releasing Stephen Murray down the middle but as the midfielder pulled the trigger, Johnny Taylor was on hand with a timely tackle to avert the danger. At the other end, Michael Ruddy’s cross from the left was met with a full-blooded volley by David Cushley but his effort flew wide of the mark. Ballymena came close on 16 minutes when David Cushley’s through ball was half headed clear by Stephen Moan and Matthew Tipton’s instinctive snap-shot from the edge of the area went narrowly wide. United took the lead on 35 minutes with an intricate move which saw Matthew Shevlin release Tony Kane on the right hand side of the penalty area. The full-back advanced forward and rolled the ball across the face of goal for Matthew Tipton to convert from six yards. Kane’s attacking instincts were again evident as he intercepted a pass in midfield and strode forward before firing a left foot shot just wide of Aaron Shanahan’s far post. Warrenpoint’s best chance of the half came just short of the interval when Darren King’s cross from the right was met by the head of the in-rushing Mark Hughes but the effort was straight at keeper Dwayne Nelson. Ballymena doubled their advantage two minutes after the restart. Eoin Kane went on a slaloming run which saw him brought down by Stephen Moan just outside the Warrenpoint penalty area. Tony Kane tapped the resultant free kick into the path of David Cushley whose low effort cannoned off the inside of the near post and rolled into theopposite corner of the net. Warrenpoint halved the deficit on 58 minutes when Dermot McVeigh’s cross from the left was spilled by Nelson and although the keeper blocked Daniel Hughes’ follow-up effort on the ground, the ball rebounded to Stephen Hughes who forced the ball home from eight yards. Ballymena should have restored their two goal advantage on 70 minutes when Cushley’s low corner wasn’t cleared but United defender Johnny Taylor somehow scooped the ball over from inside the six yard box. The home side squandered a glorious chance to draw level on 75 minutes when Mark McCabe burst clear after Taylor lost his balance but the Town sub could only shoot against the legs of the outrushing Nelson. Warrenpoint finished the game with 10 men after Stephen Moan was sent off for a second booking, a foul on Matthew Shevlin. Warrenpoint Town: Shanahan, King, Boyle, Moan, McVeigh, Bagnall, Clarke (sub McDonald 51), S Hughes, Murray (sub McCabe 74), M Hughes (sub Rooney 63), D Hughes. Subs (not used): Dane, Smith. Ballymena United: Nelson, T Kane, Taylor, Ervin, Ruddy, Jenkins, E Kane (sub Thompson 89), Faulkner, Cushley, Tipton (sub Gawley 80), Shevlin. Subs (not used): McVey, Magennis, Henderson.